Long ago, I created a blue jay block live at a neighborhood fundraiser. I’m bringing it back into my work, and it makes sense as certain ideas are really circling around as I’m reviewing what it means to be going into year 10 of business. The blue jay is such an interesting, beautiful, and amazing bird yet it often gets a bad rap for disrupting the typical backyard community and people unfairly judge it for all that it really offers and what they think it is. The blue jay is simply misunderstood and sometimes therefore ultimately feared or even disliked, but alas, it is an asset to have if you take the time to appreciate and understand. As you really start to research them you’ll find they are highly intelligent, highly adaptable, social, and family oriented. I’m a therefore a fan of the blue jay. As I’m typing this I’m suddenly remembering as a child I would put on my navy corduroy’s and navy zippie hoodie, pull the hood over my head and declare that I was a blue jay! I still wear a navy blue zip hoodie, and maybe I am still feeling like that blue jay from time to time… And now to the swan. I’m wrapped up in the blue jay in my brain at the moment and I’ve talked briefly before about the swans significance so let’s cut to the chase here. 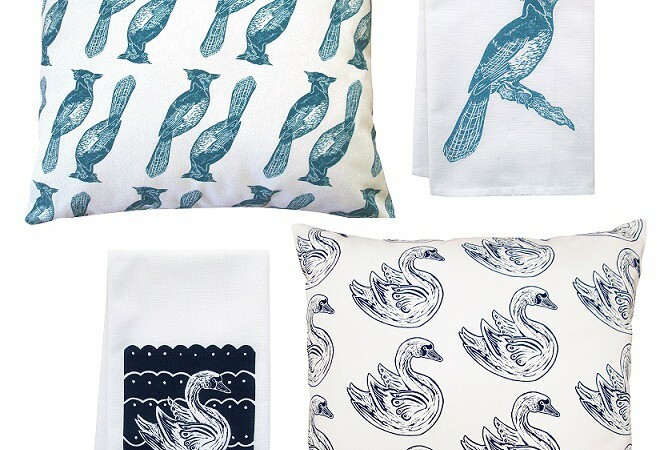 There’s a brand NEW colorway in town and the organic swan tea towel is now available in Navy to go with the existing 16×16 designer fabric swan pillow, and of course back to the blue jay, also NOW available in shop the NEW 16×16 designer fabric pillow! BRAND NEW blue jay designer fabric pillow, and organic tea towel. 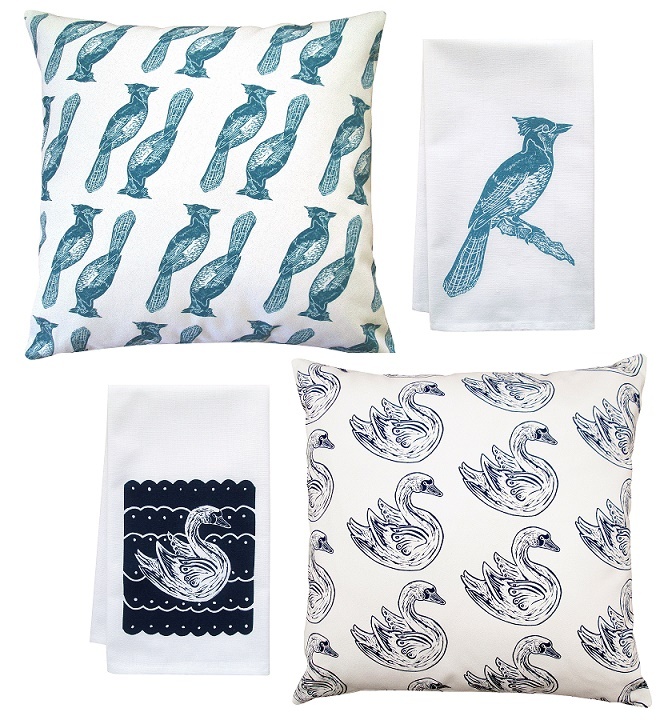 And brand NEW navy swan tea towel colorway to go with the existing designer fabric swan pillow. Available in shop NOW! 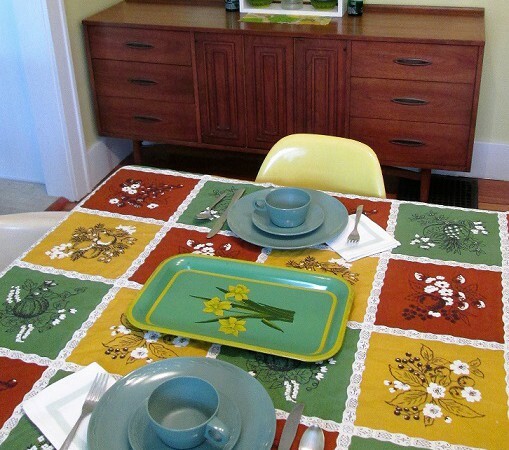 Color of the Month March 2016! March! Yes! Getting close to Spring and green and gardens and plants, my fave! I got a nice dose of Spring while I was out in Seattle. I also got a nice dose of seasonal allergies there at the end of my trip which I was mindful to just embrace while I enjoying the daffodils, crocuses, gorgeous blooming camellias, and other amazing flowering plants and bushes that really popped. Plus, I find that having a dose of pollen from a trip pre at home allergy season helps in an immense way, so I should be all set this year! 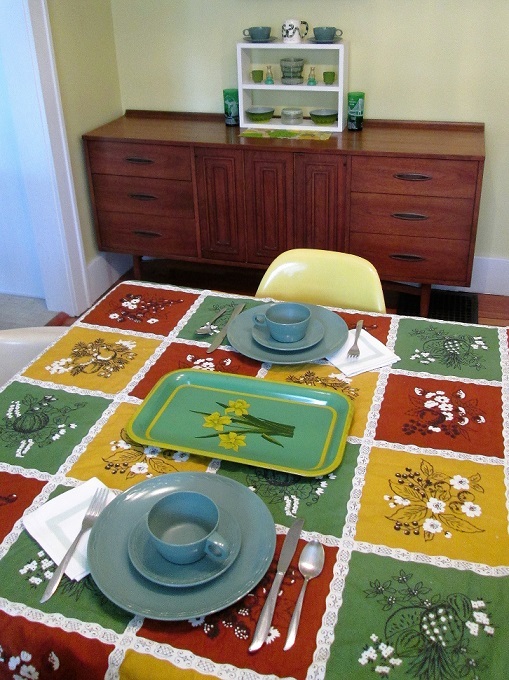 Anyway, ode to all things green with this color of the month. A bit of a dingier green mix, the kind that starts to surface from the grungy muck of post winter. 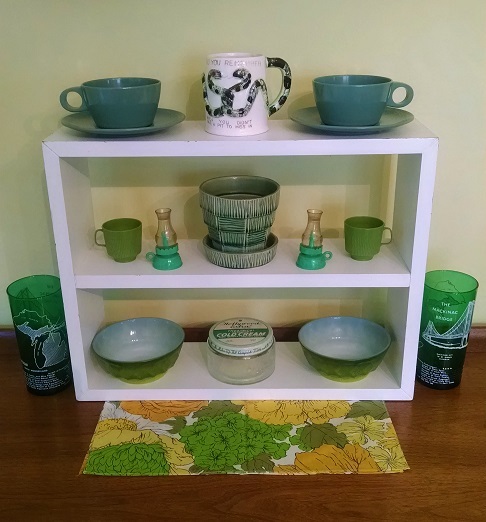 Fave vintage: melmac cups, kitschy snake mug, toy cups, lamp salt and p’s, McCoy pot, Fire King bowls, Hollywood Extra cold cream jar, and MI Mackinac Bridge glasses, anchored on a pretty springy floral napkin.